What is a Fly Fishing Vise? What Makes a Good Fly Fishing Vise? How to Use a Fly Fishing Vise? Fly fishing is a thrilling sport that involves skill in a great deal of arenas. On a basic level, it’s the angling method that involves using an artificial “fly” to lure and catch fish. These flies are often elaborate, colorful pieces made to imitate a fish’s natural food source. Though some fly fishers may prefer to buy ready-made flies, there is a large group of people who choose to construct their own through fly tying. 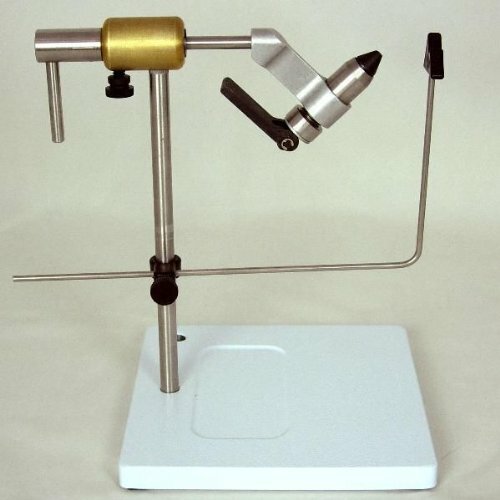 A fly fishing vise is essential to the process of fly tying, and there are many different models on the market to pick and choose from. In this article, we're going to highlight some of the best fly fishing vises currently on the market! A fly fishing vise is a device used to hold a hook in place as the tyer constructs the fly. The vise attaches to a table or a pedestal base that allows for leverage and mobility when tying a fly. Most vises come with various attributes, such as 360-degree rotation ability, that make it easy for a tyer to properly design an elaborate fly. Fly tying has been done for over a century and used to be completed all by hand. One of the first references to a fly tying vise is in a fly fishing manual from the late 1880s. Since then, vises have become very common and popular in the fly tying world. Although some people do still choose to hand tie their flies, vises make the process easier and allow for much more mobility and variation when it comes to tying. If you don’t want to spend money on a vise, there are resources to help you learn how to tie by hand, but in the long run, fly fishing vises are a great investment that will make your life a little bit easier. Though all fly fishing vises have the same function, they are not one and the same. In order to make sure you choose the best vise for you, the one you pick should have most, if not all, of the following qualities. Versatility - A great fly fishing vise should be able to hold hooks of all shapes and sizes snugly and securely. If a vise is only able to grasp one or two sizes of hooks, skip it! Durability - Durability is super important when it comes to a fly fishing vise. Finding something that is well made with strong material will last you decades rather than years. Vises that are cheaply made can easily crack, bend, or groove over years of use. 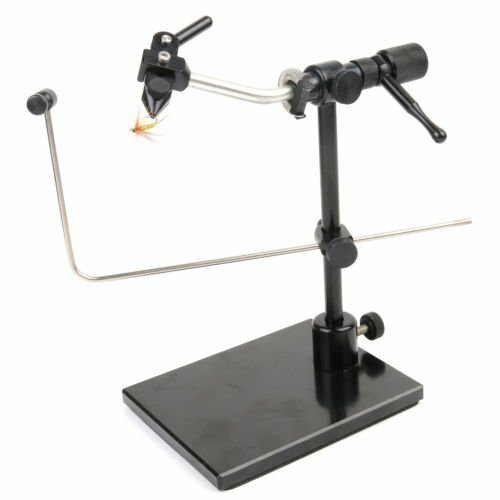 Moveable - Buying a vise that has a 360-degree range of motion will be very helpful in the process of fly tying. It allows the tyer to inspect the fly from all angles without removing it from the vise. Powerful - A vise should be able to clamp down tight on a hook without any wiggle room. Finding a vise with this capability will save you a lot of trouble in the long run. 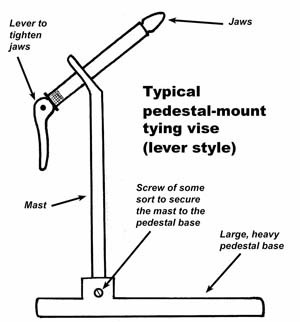 Be aware that there are two major types of vises to choose from: a C-clamp vise, which attaches to a table, and a pedestal vise, which has its own stand. Material, design, and price will all come into play when deciding which vise is best for you. Because there are many different vises on the market, we’ve compiled a list of products that will get you a great start on picking the right vise for you. Which one you choose will depend on your budget and your own fly tying needs, but the following choices are all great for different reasons. This Peak fly fishing vise is the old faithful of vises. Constructed with aircraft aluminum, stainless steel, brass, and tool steel, this vise is made to last through decades of fly tying. It features a large pedestal base, which is heavy enough to be stable when placed on any flat surface. This vise will hold hook sizes from 2/0 down to the smallest hooks purchasable. Minimal effort is required to adjust the vise to your preferred height with its rotation resistant adjustment screw. This vice is a great option for anyone looking to tie flies, regardless of whether you’re a first-timer or a more seasoned professional. It’s a no-frills deal made with durable, long-lasting material not likely to crack or groove over time. While some people have complained about parts of the vise being flimsy, the majority of users found no problem with the material. Skip this one if you’re planning on tying on hooks larger than 2/0. ​This vise from Wolff Industries comes with several attributes that make it a great fit for any fly tyer. It’s got a great hook fit range, able to hold sizes from 7/0 down to 32. 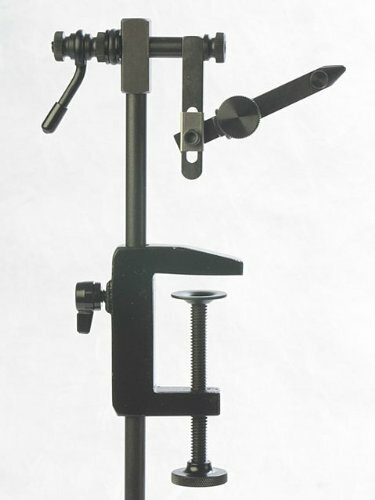 The piece comes with two options for the base, a pedestal, and a C-clamp, which allows the user to choose what is best for them depending on their fly-tying setup. Made from stainless steel and tool steel, this vise is made to last. 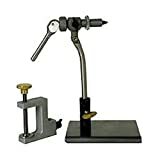 This vise is recommended for tying all types of flies, no matter your skill level. This vise has a sleek, simple design that will work well for expert tyers and novices alike. Keep in mind that the stem is shorter than average, so you may have to place it on an elevated surface to work comfortably. ​The Griffin Odyssey Spider is self-described as “an entry-level fly tying vise for an entry-level price.” This is a great starting vise for anyone looking to tie flies for the first time. 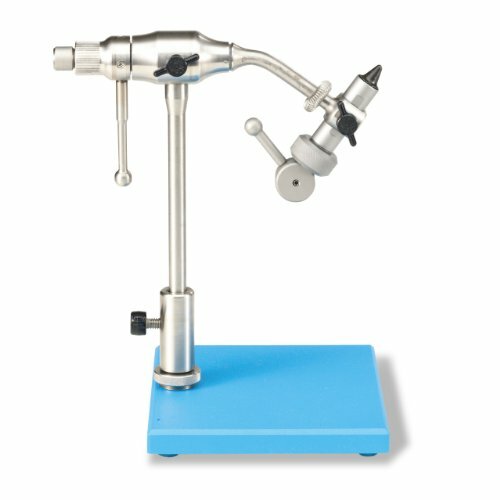 This piece holds hooks from sizes 4/0 to 28 and is a true 360-degree rotating vise, allowing for full views of all parts of a fly. The C-clamp style design can connect to your fly tying workspace easily. If you’re a newbie to the fly tying world, this is a great choice for you. It’s affordable and easy to use, and the 360-degree rotation ability is a great quality to have in a first-time vise purchase. If you want something without plastic, skip this vise. Many of the smaller pieces of the construction use plastic, but this makes it lighter and easier to travel with. ​This Atlas Rotary vise is a sleek, beautifully designed piece that can help you tie intricate flies with ease. The vise is constructed with durable materials that will last for years, including stainless and tool steel. It also has the option of attaching a pedestal base or a C-clamp, depending on your own needs and preferences. The rotary function allows for a view of the fly at all angles. This piece can hold hook sizes ranging from 7/0 to 32. This vise is another great option for newbies and experienced fly tyers. The best part about this model is the material it’s made from; steel will last a lifetime and is not likely to groove or crack like plastic does. This vise has a bit of a learning curve and may require some extra purchases to make it as functional as possible, but overall this is a great option for all. ​A classic fly fishing vise, the SF vise is a rotary piece made with durable materials. Aluminum and iron keep this model sturdy and secure with tough jaws that can handle hook sizes from size 4/0 down to 28. It also features full rotary action with rotary tension to allow more movement. This is a pedestal vice, with a heavy base to keep the stem in place. This vise is yet another great option for beginner fly tyers who would like to try their hand at the craft for the first time. It’s simple, easy-to-use and adjust, and doesn’t involve a lot of work on the user’s end to set up. It is a heavy vise with some design flaws that make it a little awkward in some positions, so be aware of that before purchasing. To ensure your vise can be used for years, some light maintenance is necessary. Always brush off clippings and trimmings that may have fallen off during your tying process after use to avoid scraps in the vise’s nooks and crannies. You can do this using a toothbrush, dental pick or any small brush. Once or twice a year, depending on how much you used your vise, you may want to do a deeper clean. This can be done by disassembling the model and rubbing it with a mild solvent on a clean, soft flannel. If you find your vise is a little squeaky, you can use a lubricant to coat the knobs and joints. The head of the vise, near the jaws, should also get some attention, as it does a great deal of work. Once you’ve finished with the lubricant, you can reassemble the vise and it will be ready to go for another year or so. Always keep your vise stored in a safe place where it’s not likely to fall or get wet. This will prevent rusting and unwanted damage over time. Setting up a fly fishing vise should be fairly easy and will depend on the type of vise that you purchase. If you have a C-clamp vise, you can tighten it onto a surface where there is good lighting, such as a desktop or a windowsill. The first step is to connect the stem to the pedestal. The main shaft, which connects to the jaws where the hook is held, can be adjusted by screwing the knobs on either side. The hook should be as close to the end of the jaws as possible so there is ample room to tie. Some vises have a lever at the end of the head which controls the jaws. In this case, there is an adjustable screw near the front of the jaws. When in doubt, always read the instructions that come along with your vise. Each one is unique, so the processes could be more or less complex. When it comes to fly tying, vises are an important part of the equation to make your experience smooth and simple. Though there are many things to keep in mind when making your choice, all of the vises on this list will be a great start in your fly-tying journey.